So there is this figure saying the temperature has risen 1.8 degrees since 1880? How could you possibly break down the cause over 140 years? Let's say someone theorizes that half is caused by human activity and the other half is caused naturally. That means .9 degrees is responsible for each. So what is... show more So there is this figure saying the temperature has risen 1.8 degrees since 1880? How could you possibly break down the cause over 140 years? Let's say someone theorizes that half is caused by human activity and the other half is caused naturally. That means .9 degrees is responsible for each. So what is the margin of error on that .9 degree figure? What is the margin of error on the 1.8 figure? It seems a little hokey to say you can possibly know a relatively minuscule change over 140 years by measuring retrospectively and with models that have margins of error. Update: How could possibly keep a straight face by saying your less than 2 degree figure should not be questioned? Update 2: How could you possibly keep a straight face by saying your figure is accurate to 1/10th of a degree? When you fart at a cocktail party and people move away from you, how can you be certain those two events are connected? Couldn’t it just be coincidental? IT is caused by both, and we people make it happen faster than it should be. One thing for sure is that natural occurrence could at any time carry the day. The Little Ice Age lasted for several centuries. Origin unknown. I am becoming convinced that the Sun brings us not just the energy but we are being broadcast everything in detail. It is the will of the Sun. But the will of the Sun is very various. Makes a man wonder why Sun worship isn't bigger than it is. If you are an atheist, you could at least worship the sun. Pick up some rays. Get a good tan. (Could be useful in the business you'd be in). Extra burning of fossil fuels since the beginning of the Industrial Revolution a little over 200 years ago. Obviously they can't but it is hard to push an otherwise unpopular and hate filled agenda so they lie and they exaggerate and they insult. I have had enough of their crap. It wasn't too long ago that these sorts or leftist wackos would have been ignored. Now they are the mainstream of a major political party and they are a danger to everyone. They need to be properly labeled as the wacko dangerous leftists that they are. It isn't about science with these clowns. If it was, you could get a satisfactory answer to your question. They aren't really interested in the answer. It is more about fooling the gullible. They figured out all the naturally occurring warming and it didn't add up to what we have observed. Add in the human emissions of CO2 and the warming it would theoretically cause and it matches up pretty well. Not a 100% accurate way of figgerin out whats happening, but the ONLY way to account for what is happening. It is a good question and one I have never seen satisfactorily answered. People have validated the assumption by using computer models but that is not really good enough. Imagine if I thought my dice was loaded and always produced a six. Then, instead of doing a real test, I make a computer model that contains everything I believe. Then when you ask me about my dice I get you to run the model and see what it says. When it says "six" I have not really proved anything, have I? We have a climate that we know has changed by several degrees in a decade in the past and now we are looking for smaller increases over a longer time. We do know that there is some man-made warming because the scientists add it in the form of "adjustments". Strangely, the graph below no longer appears on the NOAA site. Perhaps it was too incriminating? Also, in Australia, where some people keep an eye on what the official scientists are saying, they notice that certain places have long past temperatures that are now falling. How can that be? If most corrections cool the past or warm the present then we have a source of anthropogenic global warming right there! Natural, I take means Nature. Man is not more powerful than or will never be as powerful as Nature. Therefore, human activity is nil. Human caused or natural remains a question in my mind. We also had the decimation of some whale species which greatly contribute to phytoplankton blooms which in turn sequester carbon/CO2. So we had a double impact around the 17-1800's era and in the prevailing years afterwards of the great losses of whales and increases in carbon emissions....both man-made conditions. What would the figures look like today had we not decimated whale populations and the ecosystems that rely on them? or the decimation of other species? Seems like all the focus is on one part of the picture and no viable solutions such as the GND. For me, plastics/debris in the oceans seems to be a more critical issue. By some estimates/extrapolations, there will be more debris/plastics/microplastics in the oceans than fish by 2050. Cleaning the oceans, change the plastics culture we have and restoring whale populations would seem to be a more urgent need and resolve AGW issues as well. Wouldn't hurt to utilize alternative energy sources or improve efficiencies if it can be done in an economically viable means. 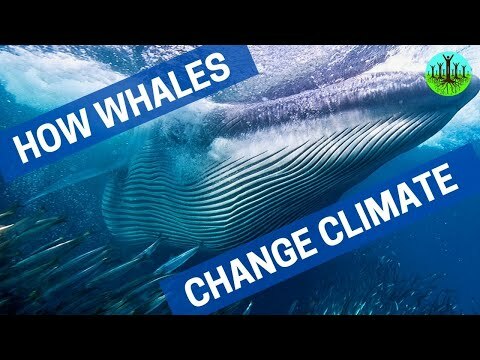 "Why whale poo could be the secret to reversing the effects of climate change"
" .....it also raises a hitherto unexplored prospect, that climate change may have been accelerated by the terrible whale culls of the 20th century, which removed hundreds of thousands of these ultimate facilitators of CO2 absorption. As Greg Gatenby, the acclaimed Canadian writer on whales told me in response to the Vermont report, "about 300,000 blue whales were taken in the 20th century. If you average each whale at 100 tons, that makes for the removal from the ocean of approximately 30m tons of biomass. And that's just for one species". So there is this figure saying the temperature has risen 1.8 degrees since 1880? How could you possibly break down the cause over 140 years? UK has cut Co2 emission by more than Sweden- UK -7.8 percent. Sweden's cut by 7.7 percent.Why do we have Swedes here telling us what to do?